This concept was made few years back. The concept is a polymer spoon with 2 heads. One for spooning up sugar and other one got thee in it and to stir. Because you stir with the tea instead of traditional bag where you only dump, you will extract more tea into the water and faster. And to extract even more and to get the tea pad dry you can push the last drop of tea out. 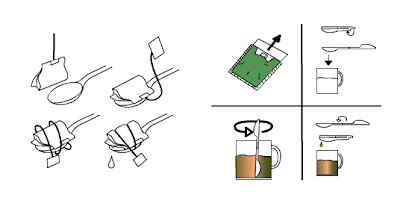 I got the idea a technic some people uses to extract last drop of tea of of the teabags. This is a great concept for commercial use but the problem the productions is too expensive compare to the conventional teabag design. Because the conventional teabag uses less materials to produce. How ever the tea pad in this concept is smaller because I calculated and researched how much you need for a single teacup. And it is perfect for this design because it is one teaspoon. And a teabag got more then just one teaspoon. For home use could be metal spoon. But means allot of very small teapads instead of big ones like in the Senseo. But allot of people are using Senseo today and making this concept less likely to be produces or be used.